The island of Flores is Nature in all its exuberance. Deep valleys cut by streams. Peaks and hills marking the horizon, breaking up the landscape. Rolling countryside that descends to the coast and ends in vertical cliffs. Cove, mild sharp, rocky capes. Everywhere is greenery plants and flowers, and edging the fields, in strips that stretch for miles and miles up and down mountains and valleys, the sky blue hydrangeas. 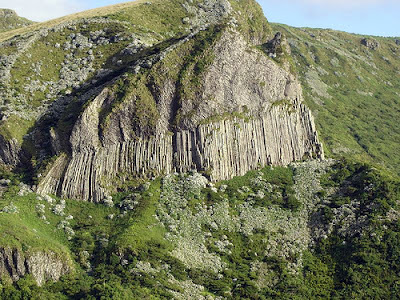 A curious geological phenomenon, originated by the solidification of basalt in high, vertical channels, forming a majestic headland. Near the base and at sea level, are the "Hot Waters", small hollows filled with boiling, sulphurous water. In some coastal areas there are other basaltic formations, though of a smaller size.